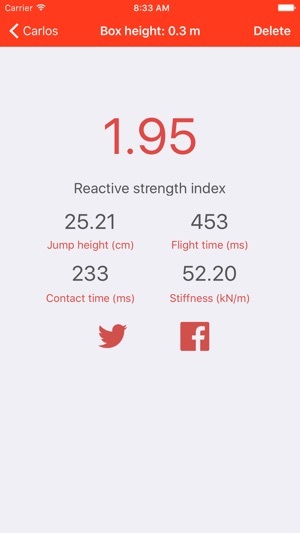 My Jump is the first app scientifically developed to measure your jump height. 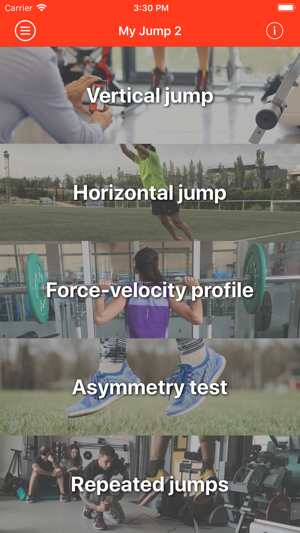 With a great design and validated by sport scientists, My Jump is as reliable as a 10000$ force platform. Scientifically probed! 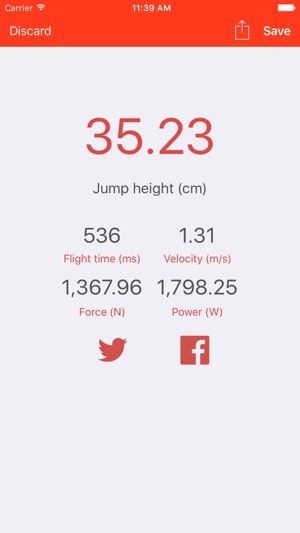 My Jump gives you advanced information of your jumps using the camera on your iPhone, iPod touch or iPad. Just record a jump, select accurately its take off and landing and lets My Jump do its magic. 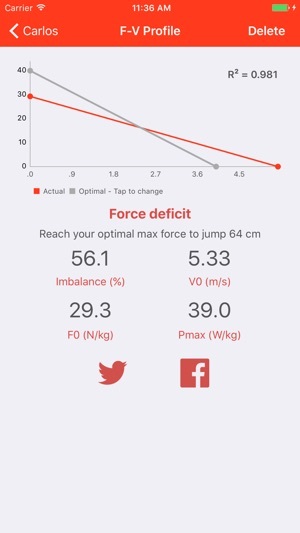 My Jump calculates the height, flight time, velocity, force and power of your vertical jumps. Also, it gives you the contact time, vertical stiffness and reactive strength index (RSI) of your Drop Jumps. Moreover, it allows you to calculate your Force-Velocity profile using Samozino's method. Complete analysis of your jumps right on your hand! • Accurate measurement of your vertical jumps. Scientifically demonstrated! • Calculate the force-velocity profile using the groundbreaking Samozino’s method. You can know your maximal theoretical force, velocity, power and how far you are from your optimal capabilities! You can even get information about which quality (force or velocity) you should work to increase your explosive performance. • Record stunnig slowmo videos up to 240fps or import as much as you like from your camera roll. • Different jump types: countermovement jump (CMJ), squat jump (SJ), drop jump (DJ) and CMJ free arms allowed! • Annotate the external load used (CMJ & SJ) or the height of the box (DJ) to organize your best performances in different categories. • Multi-user. My Jump allows you to create as many users as you want. Monitor all your team on your iDevice! • History. Record as many jumps as you want for each user created. With My Jump you can analyze the evolution of your performance during time. You can even observe exactly how much you have improved! • Export your data to Excel, Numbers, Google Drive and more! • Beautiful, intuitive iOS10 like design. Note: My Jump was scientifically validated using an iPhone 5s, and it takes advantage of the slow-motion video recording on current iOS devices the iPhone 5s, iPhone 6 and iPhone 6 Plus, iPhone 6s/6s Plus, iPhone 7 /7 Plus, iPad Air 2, iPad mini 4 and iPad Pro. On other older devices, the measurements are slightly less accurate, but still reliable. MY JUMP, A JUMP PLATFORM RIGHT ON YOUR HAND! I should have done more to research the app before spending 10$ on it. Not practical for Hs Strength coach. 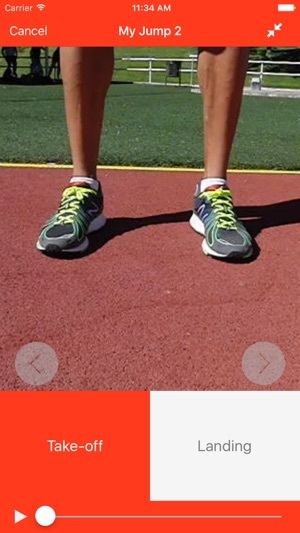 Would take you couple weeks to measure every athlete and test them using the app. More suitable for private coaches with 1-3 clients or just choosing a few student ath to test. Cool app but a lot to set up before you actually get information. I am loving this app. Using it to validate contact times of my Just Jump contact May.